Perry Emerson Meyers, 79, of Lynn, passed away peacefully on Sunday, September 9, at Reid Health Hospice after a long illness. He was born in in New Garden Township on the family farm on May 13, 1939 to Howard Frederick “Dutch” and Rena Jeanette Peden Meyers. He was the descendant of early German and Scotch settlers and was an amateur historian and genealogist. 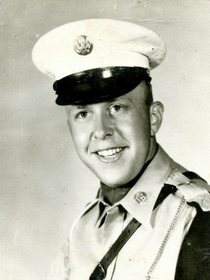 Perry was a 1957 graduate of Fountain City High School. He was a US Army veteran of the Vietnam Era. He was employed by Miller Dairy, Johnson Sheet Metal and retired from Masonite Corp.
Perry was preceded in death by his parents and one sister, Anna Mae. Perry’s life will be celebrated at 11:00 a.m. on Thursday, September 13 at the Smith-McQuiston & Webster Funeral Home, 321 US 27 South, Fountain City. Interment with military rites will follow in Willow Grove Cemetery. Family and friends may gather from 5-8 p.m. on Wednesday, September 12, at the funeral home.